Despite the fact cake is actually my drug of choice, every year at Christmas I become a cookie dervish. I tell myself it's because I'm developing the repertoire I will be known for later in life, but I think it's really just because I finally have an excuse to bake and bake and bake and no one will ask me what I'm going to do with all of those cookies. Seventeen or so dozen cookies later (gingerbread, sugar, springerle, candy cane cookies, brownies, chocolate raspberry drizzle, chocolate peanut butter chunk, stained glass, macaroons and chocolate butter snowflakes, if anyone was interested), I turned my attention to a cookie tableau. Reading a Theresa Layman book on gingerbread gave me the idea for a tableau, but I decided to make mine out of sugar cookies and have an undersea theme. I have a very good friend who has been so supportive in pretty much every area of my life, and I knew he'd appreciate something edible for the holidays. What I didn't know was that Mother Nature was conspiring against me. The blizzard that dumped two feet of snow on the mid-Atlantic forced me to fly home for Christmas two days early and sent my tableau plans sprawling. The Christmas rush forced me to give a non-edible present to my friend, but I still wanted to make a tableau, so I shifted my sights to a gingerbread winter scene. A trip to Michael's yielded gel paste food coloring and a foray into Wegmans' bulk candy aisle gave me all the decorations I needed (and plenty to snack on). I ended up using Spree, Jelly Belly jelly beans and candy canes. I would recommend a little planning with this since my lack of design had me dithering in the candy aisle for longer than absolutely necessary, but if you're at all like me, you can totally do this by the seat of your pants too. First I used a lebkuchen recipe from Festive Baking by Sarah Kelly Iaia. 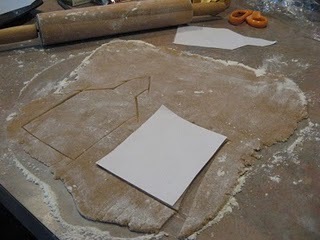 This is my go-to gingerbread recipe. It uses honey instead of molasses, so you can taste the spices rather than the syrup. 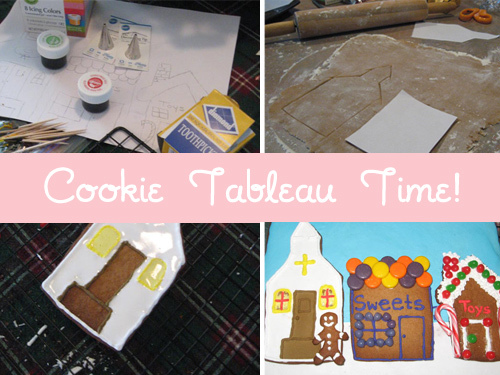 I used one whole recipe total in making the background and then the buildings and little gingerbread man. I drew templates free-hand and cut them out with a paring knife. 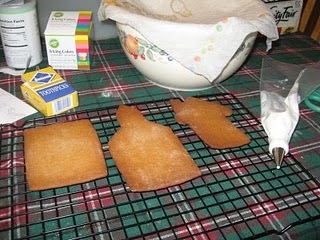 Baking them in an unfamiliar oven yielded slightly crispy edges, but those were neatly covered by royal icing. From there I just decorated the buildings as my imagination dictated and space on the background allowed. I did make one mistake which couldn't be fixed due to lack of time. 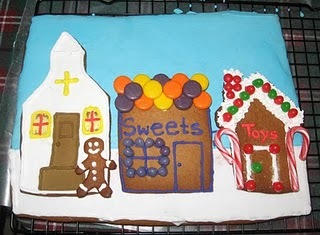 I added too much water to my yellow piping icing, so the windows to the church weren't fully flooded. Some of the "icing" soaked into the cookie. I also wouldn't recommend taking shortcuts with the icing as I did with the sky. 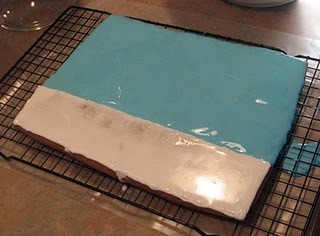 Rather than make a whole new batch of royal icing, pipe a border and then flood, I just flooded the whole thing, which led to rather messy edges. I wasn't too worried about thin coverage in the middle since the buildings were going to cover most of it. I made a few sugarwork decorations and let everything dry for two days. 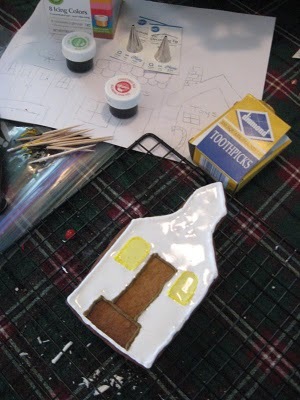 A little Karo syrup glue to attach the buildings to the background, and I was finished. The final size was about 8 1/2 by 11 inches. I really enjoyed myself despite a total lack of architectural and drawing skills, and I definitely plan to make another one soon. This time I will have a much more detailed plan beforehand!